France is bracing for unrest as the Yellow Vests have been holding a rally— called Acte 5: Macron Démission (Act 5: Macron's Resignation) — for the fifth weekend, with 70,000 police officers being mobilised ahead of the demonstrations. According to the organisers of the protests, this weekend the Yellow Vests are rallying "for social justice and tax, for a real democracy, for equal rights, for a true ecological transition." France has seen a wave of mass protests since mid-November, when the so-called Yellow Vest protesters — named after the obligatory attribute of French drivers — took to the streets to rally against rising fuel prices and a planned hike in tax on diesel and carbon fuels. The rallies have been marked by violent clashes with police officers, who have used tear gas and rubber bullets against the protesters. The French government has scrapped its planned hike in diesel taxes that sparked the protests, but the Yellow Vests have since morphed into a broader movement against government policies and rising living costs. According to BFMTV, about 1, 200 people were protesting in the French city of Nantes. As a result of the demonstration, four protesters and two policemen were injured. As the local authorities reported, the protesters damaged a city bank building and set on fire a car. 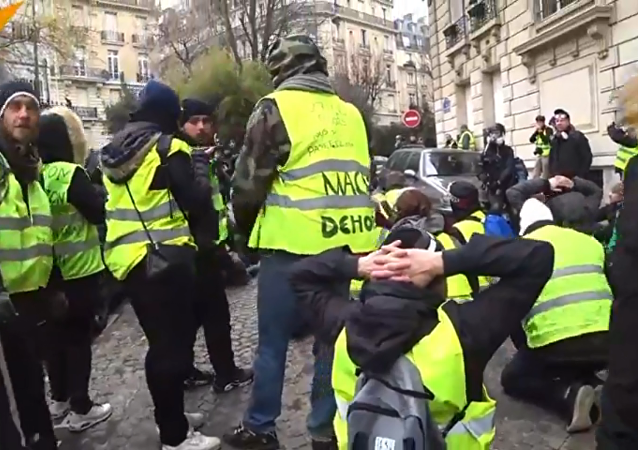 The number of "yellow vests" detained at the protests in Paris exceeded 150 people, more than 100 people were placed in custody, BFMTV reported, citing the prefecture of the metropolitan police. — Clément Lanot (@ClementLanot) 15 декабря 2018 г. Fewer than 3,000 "yellow vest" demonstrators turned up in Paris for what was the fifth consecutive Saturday of mass anti-government protests, the city's police said. At least 95 were arrested by police, with 63 people held for questioning. 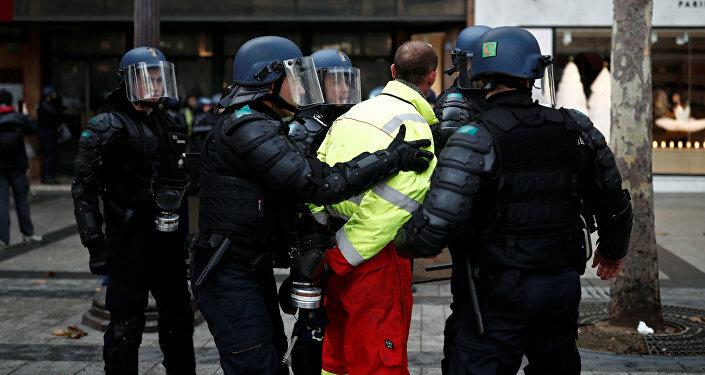 First clashes between protesters and police have been reported in Paris. — Raphael Satter (@razhael) 15 декабря 2018 г. According to the Paris police prefecture, about a thousand people take part in demonstrations in Paris. They mostly gathered at the Champs Elysées and the Place de l'Opera. In total, there are about two thousand protesters in the country, BFM TV reported, citing police sources. The leader of the right-wing National Rally political party (former National Front), Marine Le Pen, wrote on Twitter that "ultra-radical hooligans and looters in the suburbs are objective henchmen of the authorities, who divert attention from the demands of 'Yellow Vests' in order to focus on talking about security." "The country needs calm, it needs order, it needs to find a normal functioning", Emmanuel Macron stated at a press conference in Brussels on Friday when asked whether he planned to call on the protest movement's participants to avoid taking part in Saturday's rally. Despite Emmanuel Macron’s conciliatory speech on Monday, during which he pledged he would raise wages, cut taxes and give out bonuses, the Yellow Vest protest movement has not backed down. Sputnik spoke to Professor of French Studies at the University of Warwick, Nick Hewlett to ask what can be expected from the Gilets Jaunes this weekend. According to a Sputnik correspondent, a lot of police cars are seen at the Saint-Lazare station, where the rally's participants are used to arrive from the suburbs of Paris. They selectively inspect some of the passengers arriving at Saint-Lazare, in search of weapons and other prohibited items.